Our complete range of helical gearmotors provides the optimum size and power solution for every drive task. And for applications where weight is an issue, our multi-stage gear units provide something special: Thanks to their die-cast aluminum design, the models R07, R17 and R27 are three particularly efficient lightweights – ideal as satellite drives and for use in light machine constructions. Reduced backlash helical gear units are also available for particularly precise requirements. 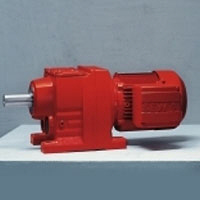 Purchase your SEW Eurodrive Helical Gear Motor R Series today!